Liga Privada T52 cigars have been meticulously blended over a period of two years to be a worthy humidor companion to Drew Estate's much heralded Liga Privada No. 9 recipe. With notes of black pepper and spice, it is Jonathan Drew's personal choice when desiring a stronger, more robust smoke. Like its predecessor, the T52 cigar is a complex marriage of seven distinct aged tobaccos handcrafted by Drew Estate's best torcedors. The beautiful wrapper is an experimental Connecticut stalk-cut tobacco dubbed "American Habano" by the farmer who grows it. Each cigar is guaranteed to be flawless in construction, flavor and character...without exception. 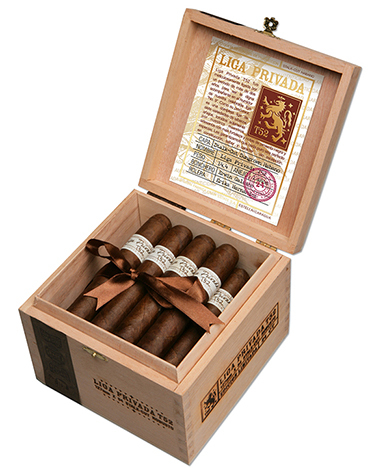 Milan Tobacconists, Inc. is a Liga Privada T52 appointed merchant.